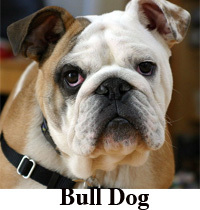 Bulldog is a breed with its ancestry to England and it is also known as English bulldog and British Bulldog. But it is different from American or French bulldog with similar appearance. The bulldog is very much loyal to its family. Even with its ‘sulky’ facial expression bulldog is friendly, adoring and gentle. Bulldogs are stout, sturdy and strongly built with muscular legs. Females are smaller than males. Their heads are very big and the large-sized cheek reaches the sides of the eyes. The heads of males are larger than that of the females. Nose is broad and black with wide nostrils. They have round dark eyes and a pair of small thin ears which are folded back this makes them distinct from American or French bulldog. The coat of bulldogs varies in color such as washed-out red, brindle, pale yellow, red or fawn. Sometimes bulldogs can be found in a mixture of these colors. BulldogsÂ constantly seek the attention and affection of human beings. Owners of bulldogs should spare time and energy with them so that they are not left alone. Bulldogs are great pet for families and they mix well with other pets also. Bulldogs do not attack people but the hard and ferocious expression makes them good guard dogs. Bulldogs rarely complain or whine as they bark only if there is a real reason. The life span of bulldogs varies but with an average life span of 13 years. Pitbulls are one of the oldest breeds that are domesticated but became unpopular due to some aggressive stories. Pitbulls bred by good breeders are sweet and energetic in nature. But some breeders are growing these dogs for illegal fighting trade which is considered as the downfall of this breed. So while buying a pit-bull, you have to be careful to ensure the temperament of the dog. 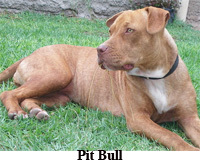 Pitbulls is sturdy, medium-sized and muscular with short smooth hairs. The dogs are characterized by large chest and a wedge-shaped head. Normally they do not have a wrinkled muzzle but they will raise their ears creating wrinkles on the forehead when excited. Pitbulls are active, friendly, intelligent, inquisitive and eager to please their owners. They require a lot of exercise. They are great family pet as they are patient and adore children. They will become aggressive to other dogs due to their breeding in an abusive environment but naturally they are not. Pitbulls longs for attention and affection. lancedeepa. "Difference Between Bulldog and Pit bull." DifferenceBetween.net. September 18, 2009 < http://www.differencebetween.net/science/difference-between-bulldog-and-pit-bull/ >.